We hold stock of both Generic & 100% Genuine Manufacturer's Original Replacement Parts. So give us a call and get your parts tomorrow. This is just a selection of our most popular parts. So, if you cannot see your part or are unsure what you need, take a look in the Parts List or please call and we'll be delighted to help. 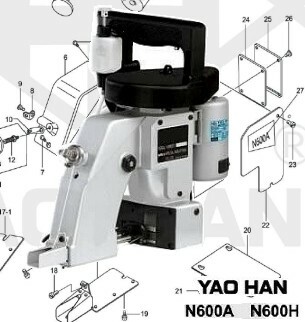 High Quality Portable Bag Stitcher which closes Jute, Paper, Hessian and PVC Bags and sacks quickly & efficiently High (1600rpm) operating speed. Built in Thread trimmer which cuts the sewn chain at the end of every closure. Automatic lubrication to prolong component and machine life. We Also Supply Bag Stitcher Thread on Larger Sized Cones. 1.5kg - 2.5kg - 5kg & 10kg Cones Available.